You might feel a little pinch. "We all understand that eyes are the most vulnerable of our sensory organs, the most vulnerable of our facial accessories, and they are (ick!) soft." — Stephen King, Danse Macabre. The more squeamish members of our audience may not wish to read further. We recommend you go here for a while instead. Thank you, have a nice day. The eyes are our window to the world. We rely mostly on our sight to tell us about the world — its wonders, its dangers, and its beauty (unless you're blind). At the same time, our eyes are mostly made of water and nerve tissue. Which means that most direct attacks on the eyes, especially with a sharp, pointy object, will destroy them. Ah. Made you wince, didn't it? The Eye Scream is when the creator of a work takes advantage of our Primal Fear of having something utterly horrible happen to our eyes, usually involving the invasion of the eye sockets by a foreign body, and plays it up for all its worth; all its squishy, bloody, traumatic worth. Academically, this is known as the Injury to the Eye Motif. An interesting commonality in these examples is that one of the best ways to quickly show a character has gone completely off the deep end is to show them mutilating their own eyes. Usually accompanied with Reflective Eyes, so we can get a nice and nasty glimpse of the incoming foreign object. 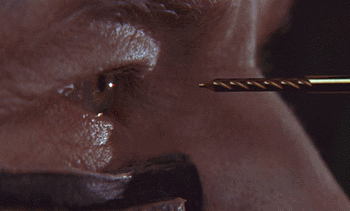 See also Go for the Eye, A Handful for an Eye, Moe Greene Special, Forced to Watch, and Eye Poke. Likewise, a Groin Attack can invoke the same primal reaction. Compare Fingore, Agony of the Feet and Ear Ache. Contrast Eyes Are Unbreakable. If the character survives it often results in an Eyepatch of Power. In Real Life, this will usually kill you unless you can get immediate medical attention, due to blood loss and shock. Has nothing to do with Eyed Screen, apart from both being Eye Tropes. I scream, you scream, we all scream for Eye Scream and calm ourselves afterwards with ice cream!